MUMBAI: Cable & Satellite (C&S) and Internet have seen a major jump in reach over the sequential quarter while radio has fallen, according to the latest IRS report. As per the IRS 2010 Q3 report, C&S reach has gone up by 23.2 per cent CAGR and Internet by 37.2 per cent. C&S total reach is up at 383.60 million, from 365.09 million in Q2. The total reach of TV media has also gone up by 7.2 per cent CAGR to 509.86 million, according to the report released today by the Media Research Users Council (MRUC). The Internet reach is at 22.52 million (22,520,000) as compared to 20.87 million (20,867,000) in the second quarter survey and 19.22 million in Q1. (See table for details). However, radio is continuing its degrowth trend. 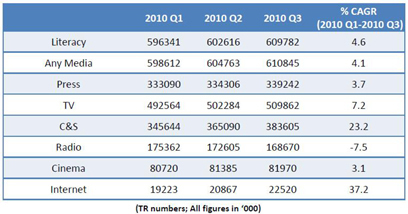 In the Q3 report, total reach of radio has seen a negative CAGR of 7.5 per cent, to 168.67 million. In Q2, the total reach for radio was at 172.60 million and in Q1 it was 175.36 million.